Geologist Patrick Dobson is an expert in geothermal systems at Lawrence Berkeley National Laboratory, a U.S. Department of Energy laboratory managed by the University of California. His research on geothermal systems and volcanic centers during his career has taken him to Japan, Indonesia, Central and South America, and Mexico. Dobson wanted to return to Mexico to work more closely with Mexican counterparts and students after attending a technical workshop on clean energy across the border organized by the California Energy Commission. “Back in the late 1970s and 80s there was a major collaborative research effort on geothermal systems between our lab and Mexican researchers. But funding dried up. We’d like to reinitiate a formal relationship,” says Dobson. A Fulbright Specialist grant was a first step to strengthening these connections between scientists from both countries. The Center for Scientific Research and Higher Education at Ensenada (CICESE), which hosted Dobson, sought out renewed ties with the Lawrence Berkeley National Laboratory to conduct joint scientific research, increase technological development, and stimulate innovation within the geothermal industry. 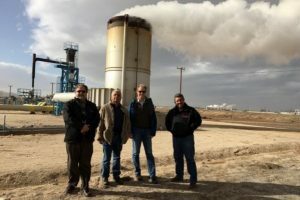 Dobson and his Mexican counterparts believe geothermal cooperation makes sense for both countries as it has multiple uses beyond power generation and could even help diversify the local economy. For instance, geothermal sites have potential as tourist attractions — like the Blue Lagoon in Iceland — since they produce mineral spas. In some places, they are also used for fish ponds and heating homes. “It’s a resource that both Mexico and the U.S. have. It’s renewable in the sense that it comes from the earth. It’s a carbon-neutral resource and it’s indigenous, which means we’re not dependent on other countries. Solar and wind are intermittent resources; but the earth is hot regardless of any other conditions. By tapping into it we could provide a valuable energy resource,” Dobson says. During his two-week Fulbright Specialist grant in January, Dobson, who speaks Spanish fluently, met with graduate students and researchers to discuss their projects and possible areas for collaboration; delivered two lectures at CICESE, which were shared via webcast to other institutions in Mexico; gave a special talk to the geothermal group of the Federal Electricity Commission at Cerro Prieto; and visited research laboratories at the Mexican Center for Innovation and Geothermal Energy, a project of the Mexican Agency for Science and Technology. Each event was an opportunity for Dobson to connect with Mexican scholars and scientists, building closer professional relationships that will pave the way for a stronger partnership with other scientists at Lawrence Berkeley National Laboratory. The highlight of the visit was a two-day field trip with a professor and his students to show them how to collect geothermal noble gas samples. “It’s more expensive than developing solar or wind energy,” Dobson admits. “You have to explore for geothermal resources so there is an inherent risk of failure and therefore higher costs associated with it. As scientists, we seek to reduce the risk to reduce the cost. That’s where collaboration could help improve techniques,” he adds. Since January, he’s been in touch with colleagues from Mexico and has hosted visits to the Berkeley Lab. 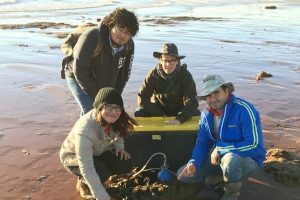 Dobson hopes to find ways to facilitate study and professional exchanges of geologists in the United States and Mexico and one day work on projects together.